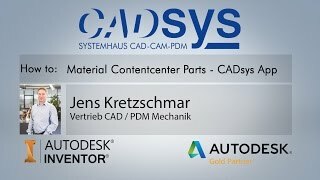 By calling the app all Content Center parts contained in the current assembly are listed hierarchically in the app’s dialog tree. After selecting one or more Content Center parts from it you can choose a new material for them from the Inventor material list. By confirming the settings, the new material-specific parts are stored in the Content Center folder and will be referenced from the assembly. The app provides functionality for generating the Content Center parts for a required material from standard parts in the time as needed, so it saves time and space. For 30 days after installation the app is available in trial mode. In trial mode the number of referenced Content Center files is limited to a maximum of 5 files.